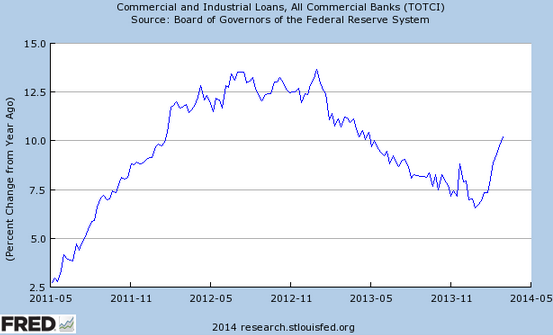 Sober Look: What's behind the sudden improvement in US loan growth? What's behind the sudden improvement in US loan growth? Credit growth in the US seems to have stabilized and may be on the rise. 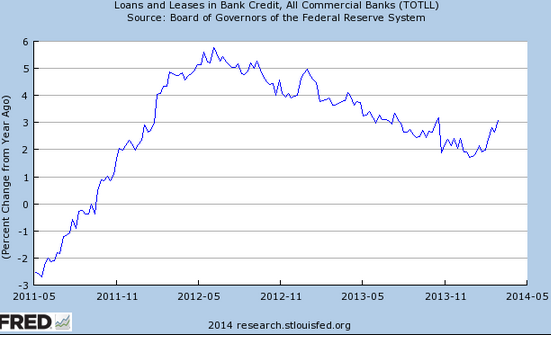 It's worth mentioning that the bottom in loan growth just happened to correspond to the start of Fed's taper. Coincidence? Whatever the case, this may be a sign of improving demand for credit and banks' willingness to accommodate. The key to this change in trend is that improvements in loan growth have been primarily driven by a sudden jump in corporate lending. Why is corporate America increasing its borrowing all of a sudden? The most likely answer is the improvement in capital expenditures (capex), which is evidenced by firmer capital goods spending by US companies. We saw initial signs of that improvement back in February (see story). There were other indications as well. ISI's latest corporate survey provides further support to this thesis. ISI Research: - Survey strengthened over the past two weeks with U.S. orders now a solid 61.5. Areas of strength include equipment tied to trucks, rail, aerospace, and construction. Whether using their massive cash reserves or tapping bank credit facilities (increasing bank loan balances), the time has come for higher capital expenditures by US firms. Here is why. Barron's: - Capital expenditures [have been] just 46% of operating cash flow for nonfinancial companies in the S&P 500. The average since 1989 is 57%. Capex can't remain low forever. Already, the average age of U.S. structures is the highest it has been since 1964. Equipment hasn't been this old since 1995, and intellectual-property products, like software, since 1983. In a report issued this past week, Bank of America Merrill Lynch predicts U.S. capex growth will more than double over two years, to 5.7% in 2015, from 2.6% last year. Beyond mounting cash and aging plants and equipment, it cites some new factors. Economic growth is picking up, giving business managers more confidence and less spare capacity. Congress even passed a budget this year—one less thing for business leaders to worry about. Barron's goes on to say that many shareholders are now pushing firms to increase capital expenditures. Much of the capex spending behavior in the post-recession era has been driven by uncertainty. Recently in the US we've had two major sources of such uncertainty: the Fed's taper and the federal government budget/debt ceiling. Both of these macro risks frightened corporate management enough to hold back on capex. The Fed's taper however is now on a slow, fairly predictable "autopilot" and as Barron's points out, the budget deal has removed the risk of a near-term federal impasse. As far as corporate CEO's are concerned, the major uncertainties related to the US federal government have clearly receded - for now. Thus the similarities in timing of the bottoming of loan growth in the US and the start of Fed's taper may not be a coincidence after all.